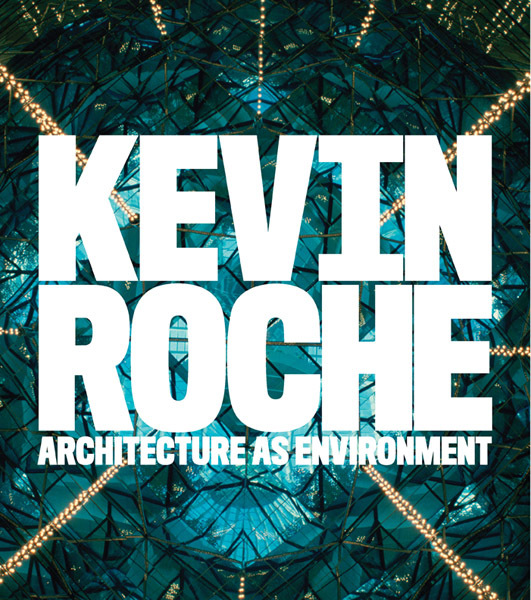 Cover of Kevin Roche: Architecture as Environment, 2011. The book Kevin Roche: Architecture as Environment (Yale University Press, 2011) offers the first comprehensive look of the career of one of the most seminal American architects of the last half-century, best known for his large scale urban projects, such as the Oakland Museum of California, the expansion of the Metropolitan Museum of Art, and the now demolished New Haven Veterans Memorial Coliseum, as well as his corporate work for such blue-chip companies as Union Carbide, Conoco, and John Deere. One of his most important contributions, the book argues, is the perception of architecture as part of the larger man-made environment, which entailed understanding transportation, infrastructure, and landscape as architectural problems; considering public spaces, including gardens, as integral to architecture; and designing some of the earliest energy-efficient buildings. Eeva-Liisa Pelkonen's scholarly work focuses on twentieth-century European and American architecture with interest the genesis and meaning of architectural form within various national and historical contexts. Pelkonen is the author of Achtung Architektur! Image and Phantasm in Contemporary Austrian Architecture (MIT Press, 1996) and Alvar Aalto: Architecture, Modernity and Geopolitics (Yale University Press, 2009); coeditor of Eero Saarinen: Shaping the Future (Yale University Press, 2006) and Art+Architecture: New Visions, New Strategies (Aalto Academy, 2007); and editor of Kevin Roche: Architecture as Environment (Yale University Press, 2011). Her articles have appeared, among others, in Daidalos, Log, and Perspecta. Her book on Saarinen received the Philip Johnson Book Award, granted by the Society of Architectural Historians for the best exhibition catalogue of the year and the Sir Banister Fletcher Prize, granted annually by the Authors Club of London for the best book in art and architecture. Her book on Aalto won the Alice Davis Hitchcock Award, also by SAH, given annually for the best piece of scholarship by a North American–author. In 2010, Pelkonen was a recipient of the Professor King-lui Wu Teaching Award, voted by the graduating class. Pelkonen's scholarly work has been supported by the Getty Foundation, the Graham Foundation, the Finnish Academy of Arts and Sciences, and the Austrian Ministry of Science and Research. Prior to coming to Yale, Pelkonen worked in a number of European firms, most notably with Reima and Raili Pietilä, Architects, in Helsinki, Finland, and Volker Giencke, Architects, in Graz, Austria. She is currently a design associate with Turner Brooks Architects, where she has collaborated on such projects as the Gilder Boathouse for Yale and the Pelkonen/Brooks residence. Pelkonen received an MArch from the Tampere University of Technology, Finland, an MED from Yale University, and a PhD from Columbia University.